Glucose-dependent insulinotropic polypeptide (GIP) is an incretin hormone secreted postprandially from enteroendocrine K cells, but despite therapeutically interesting effects, GIP physiology in humans remains incompletely understood. Progress in this field could be facilitated by a suitable GIP receptor antagonist. For the first time in humans, we investigated the antagonistic properties of the naturally occurring GIP(3-30)NH2 in in vivo and in in vitro receptor studies. In transiently transfected COS-7 cells, GIP(3-30)NH2 was evaluated with homologous receptor binding and receptor activation (cAMP accumulation) studies at the glucagon-like peptide 1 (GLP-1), glucagon-like peptide-2 (GLP-2), glucagon, secretin and growth hormone-releasing hormone (GHRH) receptors. 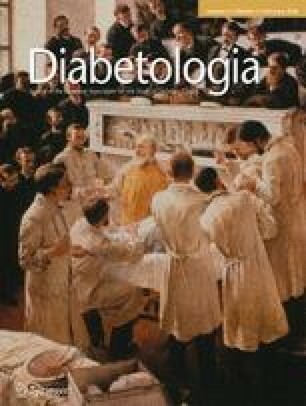 Ten healthy men (eligibility criteria: age 20–30 years, HbA1c less than 6.5% [48 mmol/mol] and fasting plasma glucose [FPG] less than 7 mmol/l) were included in the clinical study. Data were collected as plasma and serum samples from a cubital vein cannula. As primary outcome, insulin secretion and glucose requirements were evaluated together with in a randomised, four-period, crossover design by infusing GIP(3-30)NH2 (800 pmol kg−1 min−1), GIP (1.5 pmol kg−1 min−1), a combination of these or placebo during hyperglycaemic clamp experiments. The content of the infusions were blinded to the study participants and experimental personnel. No study participants dropped out. GIP(3-30)NH2 neither bound, stimulated nor antagonised a series of related receptors in vitro. The elimination plasma half-life of GIP(3-30)NH2 in humans was 7.6 ± 1.4 min. Markedly larger amounts of glucose were required to maintain the clamp during GIP infusion compared with the other days. GIP-induced insulin secretion was reduced by 82% (p < 0.0001) during co-infusion with GIP(3-30)NH2, and the need for glucose was reduced to placebo levels. There were no effects of GIP(3-30)NH2 alone or of GIP with or without GIP(3-30)NH2 on plasma glucagon, GLP-1, somatostatin, triacylglycerols, cholesterol, glycerol or NEFA. GIP(3-30)NH2 administration was well tolerated and without side effects. We conclude that GIP(3-30)NH2 is an efficacious and specific GIP receptor antagonist in humans suitable for studies of GIP physiology and pathophysiology. The study was funded by Gangstedfonden, the European Foundation for the Study of Diabetes, and Aase og Ejnar Danielsens fond. Mette M. Rosenkilde and Filip K. Knop are joint senior authors and have responsibility for the in vitro and clinical studies, respectively. Glucose-dependent insulinotropic polypeptide (GIP) is secreted from enteroendocrine K cells in response to intraluminal nutrients, in particular glucose and fat . In the fasting state, the plasma concentration is negligible, but after food intake, it reaches 40–125 pmol/l in peripheral blood . GIP is, like glucagon-like peptide-1 (GLP-1), an incretin hormone , i.e. it potentiates glucose-induced insulin secretion in healthy individuals . GLP-1-based therapies are an important part of modern glucose-lowering treatment , and the physiology of GLP-1 and its involvement in the pathophysiology of obesity and type 2 diabetes have been more intensively studied than that of GIP. One of the important tools in the elaboration of GLP-1 physiology and the development of GLP-1-based therapies is the GLP-1 receptor antagonist exendin(9-39), which was first described in 1991 , and has been applied in multiple human studies since 1998 [6, 7]. The insulinotropic effect of GIP is severely diminished among individuals with type 2 diabetes mellitus [8, 9]. However, GIP(1-42) has other physiological effects, and has been shown to inhibit bone resorption , increase adipose tissue blood flow and stimulate fat deposition [11, 12]. GIP(1-42) also affects intestinal blood flow , and stimulates glucagon secretion at low blood glucose levels [14, 15]. The relative importance of GIP for the regulation of these processes remains unclear. A major reason for this has been the lack of a GIP receptor antagonist suitable for human studies. Based on in vitro and rodent studies, many compounds have been proposed as suitable GIP receptor antagonists [16, 17, 18, 19, 20, 21, 22, 23, 24, 25]. However, due to remarkable species differences regarding the pharmacology of the GIP receptor system, transferability to humans is not simple; for instance, an acclaimed proline-substituted GIP analogue, Pro3(GIP), has antagonistic properties on rodent receptors, but is a full agonist of the human GIP receptor . GIP(1-42) is processed from the precursor protein proGIP by the prohormone convertase type 1/3 (PC1/3) . Another prohormone convertase, PC2, is present in pancreatic alpha cells  and in a K cell subpopulation . The PC2-generated product of proGIP is GIP(1-30)NH2. This isoform acts on the human GIP receptor, a class B G protein-coupled receptor (GPCR), as a full agonist similar to GIP(1-42) [17, 29]. Both GIP isoforms are dipeptidyl peptidase 4 (DPP-4) substrates, and GIP(1-30)NH2 is cleaved to GIP(3-30)NH2 in the circulation. GIP(3-30)NH2 does not stimulate the human GIP receptor, but acts as a potent and efficacious antagonist in vitro . Here, we present for the first time results on the antagonistic properties of GIP(3-30)NH2 in humans. We evaluate the selectivity of GIP(3-30)NH2 by receptor binding and activation studies in vitro at the GLP-1, glucagon-like peptide-2 (GLP-2), glucagon, secretin and growth hormone-releasing hormone (GHRH) receptors. During four 12 mmol/l hyperglycaemic clamps in healthy men, the effects on glucose-stimulated insulin secretion were evaluated during co-infusion of either GIP(1-42), GIP(3-30)NH2, GIP(1-42)+GIP(3-30)NH2 or placebo. The protocol was approved by the Scientific-Ethical Committee of the Capital Region of Denmark (identification no. H-3-2013-007) and registered at ClinicalTrials.gov (registration no. NCT02747472) and the Danish Data Protection Agency (j.no. 2012-58-0004, local no. HGH-2015-031, I-Suite no. 03967). Ten healthy men (demographics shown in Table 1) were included after a screening visit. Inclusion criteria were age 20–30 years, HbA1c less than 6.5% (48 mmol/mol) and fasting plasma glucose (FPG) less than 7 mmol/l. Exclusion criteria included acute or chronic illnesses, medication that could not be paused for 12 h, diabetes, first-degree relatives with diabetes, and abnormal blood haemoglobin levels, plasma liver enzymes (alanine and aspartate aminotransferases), plasma creatinine and urinary albumin/creatinine ratio. Written informed consent was obtained from all study participants before inclusion. Synthetic GIP(1-42) (Clinalfa; Bachem, Bubendorf, Switzerland) and GIP(3-30)NH2 (custom-synthesised; PolyPeptide Group, Strasbourg, France) were demonstrated to be over 97% pure and identical to the natural human peptide by HPLC, mass and sequence analysis. The peptides were dissolved in sodium chloride (9 mg/ml) with 0.2% human albumin (CSL Behring, Marburg, Germany) and sodium hydrogen carbonate with 0.2% human albumin, respectively, sterilised by filtration and microbiologically tested by the Capital Region Pharmacy (Herlev, Denmark) and stored at −20°C until use. On study days, the required amounts were thawed and prepared, under sterile conditions, for infusion by dilution to a total volume of 100 ml in sodium chloride for GIP(1-42) and 250 ml for GIP(3-30)NH2. Placebo infusions were 100 ml and 250 ml sodium chloride, respectively. Participants were instructed not to consume alcohol or perform strenuous physical activity for 24 h before each study day. The study participants received GIP(1-42), GIP(3-30)NH2, both peptides or placebo infusions during a hyperglycaemic clamp in a randomised, double-blinded, crossover design. The content of the infusions were blinded to the study participants and experimental personnel. On each study day, the participants met after an overnight (10 h) fast. A cannula was placed in a cubital vein for blood sampling. The forearm and hand were wrapped in a heating pad (45°C) throughout the experiment to arterialise the blood. Another cannula was placed in the contralateral cubital vein for peptide and glucose infusions. At time 0 min, an infusion of GIP(3-30)NH2 (800 pmol kg−1 min−1) or placebo was initiated, and 10 min later the infusion of GIP(1-42) (1.5 pmol kg−1 min−1) or placebo was started. At 15 min, plasma glucose was raised to 12 mmol/l by a bolus of 50% glucose (wt/vol.) according to body weight and FPG ([12 mmol/l – FPG (mmol/l)] × body weight [kg] × 0.07 ml [mmol/l]−1 kg−1) followed by an adjustable infusion of 20% glucose (wt/vol.) in order to clamp plasma glucose levels at 12 mmol/l for 45 min. Blood samples were drawn 30, 15 and 0 min before and 20, 25, 30, 40, 50, 60, 67, 70, 75, 80, 95 and 125 min after the start of the GIP(3-30)NH2 infusion. Blood was collected into chilled tubes with EDTA and a specific DPP-4 inhibitor (valine pyrrolidide, 0.01 mmol/l, a gift from Novo Nordisk, Måløv, Denmark) for analysis of GIP, GIP(3-30)NH2, GLP-1, glucagon and somatostatin. For analysis of insulin, C-peptide, NEFA and glycerol, blood was collected in dry tubes with serum separator gel and clot activator (silica particles) and left at room temperature for 20 min for coagulation. For analysis of triacylglycerols and cholesterol, blood was collected in tubes with lithium and heparin. All tubes were cooled on ice after sampling and were centrifuged for 20 min (1200 g, 4°C). Plasma and serum samples were stored at −20°C until analysis. For bedside analysis of plasma glucose (every 5 min), blood was collected in sodium fluoride-coated tubes and immediately centrifuged for 30 s (7400 g, room temperature). Plasma glucose was measured at the bedside by the glucose oxidase method (Yellow Springs Instrument model 2300 STAT Plus analyser; YSI, Yellow Springs, OH, USA). Serum insulin and C-peptide were measured with two-sided electrochemiluminescence assays (Roche/Hitachi Modular Analytics; Roche Diagnostics, Mannheim, Germany). Plasma triacylglycerols, total cholesterol, HDL-cholesterol, and LDL-cholesterol were measured by spectrophotometric methods following hydrolysis and oxidation (Vitros 5.1. FS; Johnson & Johnson, Ortho-Clinical Diagnostics, Raritan, NJ, USA). NEFA (NEFA C kit; Wako Chemicals, Neuss, Germany) and glycerol (Boehringer Mannheim, Basel, Switzerland) were measured by enzymatic methods modified to run on a Cobas 6000 automatic analyser (Roche, Rødovre, Denmark). Total GLP-1 , total GIP  and somatostatin  were measured in plasma by RIAs as previously described. GIP(3-30)NH2 was measured in plasma with an in-house-developed RIA using a polyclonal antibody (code no. 95234) raised in rabbits against human GIP(1-30)NH2 and human GIP(1-30)NH2 (catalogue no. 027-30; Phoenix Pharmaceuticals, Burlingame, CA, USA) as standard (a procedure similar to the GIP assay ). The tracer was 125I-labelled human GIP(1-42) (catalogue no. NEX402; Perkin Elmer, Skovlunde, Denmark). Plasma glucagon was measured by ELISA (10-1271-01; Mercodia, Uppsala, Sweden). The receptor cDNAs for human wild-type GIP, GLP-1, glucagon, GLP-2, secretin and GHRH were purchased from Origene (Rockville, MD, USA; SC110906, SC124060, SC120082, SC111108, SC125725 and SC119635, respectively) and cloned into pCMV Script-vectors (Agilent Technologies Denmark, Glostrup, Denmark). Human GIP(1-42), GLP-1, glucagon and GLP-2 were purchased from Bachem (H5645, H6795, H6790 and H7742, respectively) and human secretin and GHRH from Phoenix Pharmaceuticals (067-03 and 031-02). Human GIP(3-30)NH2 was synthesised by CASLO (Lyngby, Denmark) and 125I-labelled at the tyrosine (Fig. 1a) using the standard stoichiometric chloramine T method previously described . The labelled peptides were purified by HPLC. COS-7 cells (American Type Culture Collection, Manassas, VA, USA) were grown in 10% CO2 and at 37°C in DMEM 1885 supplemented with 10% FCS, 2 mmol/l glutamine, 180 units/ml penicillin and 45 g/ml streptomycin. Novel cells from the original cell stock were thawed when the passage number reached 40. The cells were further validated by phenotypic characterisation and transfection efficiency. A mycoplasma test was performed every third month on average. Receptor cDNA transfection of COS-7 cells was performed by the calcium phosphate precipitation method as previously described . COS-7 cells were seeded in 96-well plates 1 day after transfection. The number of cells seeded resulted in 5–10% specific binding of the radioactive ligand (GIP receptor, 3500 cells/well; other receptors, 50,000 cells/well). A higher cell number for the other receptors ensured the detection of any potential binding of GIP(3-30)NH2. Two days after transfection, we performed competition binding (3 h, 4°C) using 6–10 pmol/l of 125I-GIP(1-42) or 125I-GIP(3-30)NH2 and increasing concentrations of unlabelled GIP(1-42) or GIP(3-30)NH2 (1–100 pmol/l) in 50 mmol/l HEPES buffer (pH 7.4) with 0.5% (wt/vol.) BSA. The cells were washed twice in ice-cold buffer and lysed for 30 min (200 mmol/l NaOH, 1% SDS). Non-specific binding was determined as radioligand binding to untransfected cells. All determinations were made in duplicates and analysed for radioactivity using a Wallac Wizard 1470 Gamma Counter (GMI, Ramsey, MN, USA). COS-7 cells were seeded in 96-well plates 1 day after transfection. The following day, the cells were washed once with HEPES-buffered saline (154 mmol/l NaCl) and incubated with HEPES-buffered saline and 1 mmol/l 3-isobutyl-1-methylxanthine for 30 min (37°C). To test for intrinsic activity, the endogenous ligands for each receptor (agonists) or GIP(3-30)NH2 were added, and the plates were incubated for 30 min (37°C). To test GIP(3-30)NH2 as an antagonist, the cells were preincubated for 10 min (37°C) with increasing concentrations of GIP(3-30)NH2, followed by 20 min incubation with a fixed concentration of agonist that would result in 50–80% of maximal activation. Afterwards, the HitHunter cAMP XS-assay (DiscoveRx, Birmingham, UK) was carried out according to the manufacturer’s instructions. All experiments were made in duplicate, and luminescence was measured by Perkin Elmer EnVision 2104 Multilabel reader. Based on our previous data , a power calculation (probability [β] of 20% and level of statistical significance [α] of 5%) suggested that the inclusion of eight participants would be needed to be able to detect a minimum relevant difference of 25% in insulin secretion. To increase the power for evaluation of secondary outcomes and to decrease the risks of type 2 errors, ten participants were included. Results are reported as mean ± SD unless otherwise stated. Calculations of the AUC were based on the trapezoidal rule and reported as incremental AUC (iAUC). Elimination half-life calculations were based on logarithmic (log10) transformation of plasma concentrations and determination of the rate constant. Statistical analyses were performed with GraphPad Prism 7.02 (GraphPad Software, San Diego, CA, USA). One-way repeated measures ANOVA with Greenhouse–Geisser correction and Tukey’s multiple comparison were used to test for variations and differences between iAUC. A two-sided p value of < 0.05 was used as significance level. p values are summarised as *p < 0.05, **p ≤ 0.01 and ***p ≤ 0.001. The affinity of GIP(3-30)NH2 for the human GIP receptor is fivefold lower than that of GIP(1-42) as determined by homologous competition binding (Fig. 1b ). In the present set-up, we reproduced these previous findings, demonstrating an affinity (K d) of 3.0 nmol/l for GIP(3-30)NH2 compared with the previously determined K d of 0.67 nmol/l for GIP(1-42). To evaluate the selectivity of GIP(3-30)NH2, we tested whether 125I-GIP(3-30)NH2 bound to the closely related class B receptors (GLP-1, GLP-2 and glucagon receptors) by homologous competition binding. In addition, we tested the distantly related receptors: secretin and GHRH (Fig. 1c). We identified only specific binding of 125I-GIP(3-30)NH2 to the human GIP receptor (Fig. 1d). In parallel, as a validation of the presence and functionality of the receptors, we determined the cAMP responses to the agonists for these receptors, and also tested whether increasing concentrations of GIP(3-30)NH2 (up to 1 μmol/l) activated or inhibited the receptors (Fig. 2a–j). GIP(3-30)NH2 was not able to activate any of the five related receptors, whereas the positive control substances (GLP-1, GLP-2, glucagon, secretin and GHRH) bound and activated the receptors with potencies (EC50 values) of 42.2 pmol/l, 0.35 nmol/l, 0.15 nmol/l, 28.8 pmol/l and 14.5 pmol/l, respectively. GIP(3-30)NH2 antagonised the GIP(1-42)-induced cAMP response with a potency (IC50) of 87.6 nmol/l (dashed lines, Fig. 2f–j) but did not antagonise the responses of the agonists for the five related receptors. In the clinical study, total GIP plasma levels reached steady state at 50–60 min with mean concentrations of 86 ± 20 pmol/l and 87 ± 22 pmol/l for the infusion of GIP(1-42) and GIP(1-42)+GIP(3-30)NH2, respectively (Fig. 3a). As the total GIP RIA targets the C-terminus of the peptide, the elimination half-life of 17 ± 5.4 min illustrates the elimination of the sum of GIP(1-42) and the DPP-4 degradation product GIP(3-42). GIP(3-30)NH2 reached steady state after less than 20 min (Fig. 3b). The mean concentrations were 54 ± 12 nmol/l and 49 ± 9.8 nmol/l for the infusion of GIP(3-30)NH2 and GIP(1-42)+GIP(3-30)NH2, respectively. The elimination half-lives for all study days appeared similar and equated to 7.6 ± 1.4 min. The infusions did not affect the blood pressure or pulse rate during the infusion period or the following hour. No study participants experienced nausea, dizziness or other discomforts. There were no significant differences between the plasma glucose levels on the study days, and the overall mean value during the clamp was 12.0 ± 1.18 mmol/l (Fig. 4a). As illustrated in Fig. 4b, the amount of glucose infused to maintain the hyperglycaemic clamp was significantly higher during the GIP(1-42) infusion (55 ± 15 g) compared with the other study days [GIP(1-42)+GIP(3-30)NH2, 37 ± 5.3 g; GIP(3-30)NH2, 31 ± 7.5 g and placebo (39 ± 7.6 g)]. There was no significant difference between the infusion of GIP(1-42)+GIP(3-30)NH2 and placebo (p = 0.7078), or GIP(3-30)NH2 and placebo (p = 0.0929). There were no significant differences between the baseline values of insulin and C-peptide on the four study days (Table 2). GIP(1-42) markedly potentiated the glucose-stimulated insulin secretion [placebo, 8.1 ± 2.9 nmol/l × min; GIP(1-42), 29.3 ± 10.8 nmol/l × min], whereas GIP(3-30)NH2 had no effect on insulin concentrations (6.6 ± 3.4 nmol/l × min) (Fig. 5a). When GIP(1-42) was co-infused with GIP(3-30)NH2, the GIP(1-42)-induced potentiation of insulin secretion was dramatically and significantly reduced (12.4 ± 5.3 nmol/l × min), illustrating the GIP receptor-antagonising effect of GIP(3-30)NH2. There were small, but significant, differences between the insulin responses during combined GIP(1-42)+GIP(3-30)NH2 infusions compared with GIP(3-30)NH2 (p = 0.006), and with placebo infusions (p = 0.005). The inhibitory effect of GIP(3-30)NH2 based on the iAUC for the whole infusion period (Fig. 5), for the 10 min of steady-state levels of GIP(1-42) and for peak values, respectively, for insulin amounted to 80.7 ± 14.4%, 82.4 ± 12.8%, and 80.7 ± 16.0%. The same relation was seen with regard to C-peptide levels (Table 2), based on which the inhibitory effect amounted to 74.8 ± 15.4% (iAUC40 min), 75.9 ± 15.1% (iAUC10 min) and 73.1 ± 14.9% (peak values). The calculated ISR (Table 2) showed an inhibitory effect of 78.2 ± 12.9% (iAUC40 min), 73.6 ± 14.8% (iAUC10 min) and 70.7 ± 15.7% (peak values). There were no significant differences between the baseline values of the other pancreatic hormones glucagon or somatostatin. During the hyperglycaemic clamp, glucagon levels decreased similarly following glucose infusion on all study days (Fig. 6a). Plasma somatostatin levels decreased slightly during the glucose infusion without significant differences between the four interventions (Fig. 6b). The baseline values of GLP-1 were not significantly different on the four study days. GLP-1 levels increased slightly during the glucose infusion without differences between the study days (Fig. 6c). To evaluate the possible effects of GIP(1-42) on fat deposition and lipid metabolism, cholesterols, triacylglycerols, NEFA and glycerol were measured. There were no significant differences between the baseline values, and during this short period there were no differences over time or between the responses to the four interventions (Fig. 6d–i). On the basis of our previous in vitro studies [17, 37], we hypothesised that GIP(3-30)NH2 would be able to inhibit the GIP-induced potentiation of glucose-stimulated insulin secretion in humans. We found that GIP(3-30)NH2 at an approximately 600-fold higher plasma concentration compared with GIP(1-42) antagonised the GIP receptor and resulted in an 82% inhibition of the GIP-potentiated glucose-stimulated insulin secretion. Importantly, we also showed that GIP(3-30)NH2 was highly selective for the human GIP receptor and did not bind to or stimulate closely (GLP-1, glucagon and GLP-2) or more distantly (secretin and GHRH) related receptors. We chose to calculate the inhibitory effect based on the iAUC of insulin and C-peptide. As insulin and C-peptide concentrations increased towards the end of each infusion experiment, which was most pronounced during the GIP(1-42) infusion, one may argue that longer experiments are needed to obtain a more precise estimate of the maximum inhibitory effect. If we evaluate the inhibitory effect based on the amount of glucose infused to perform the hyperglycaemic clamp, the day with co-infusion of GIP(3-30)NH2 and GIP(1-42) was not significantly different from the placebo infusion. Nonetheless, since the same degree of inhibition was reached whether the calculations were based on iAUC [for both the 40 min period and for the last 10 min when plasma levels of GIP(1-42) and GIP(3-30)NH2 had reached a steady state] or on peak values for insulin and C-peptide, we are confident that GIP(3-30)NH2 inhibits GIP-induced insulin secretion by at least 80% during short-term hyperglycaemia. Human studies with GIP(3-30)NH2 have not been performed prior to these studies. The dosages of agonist and antagonist are obvious concerns as it is difficult to estimate the plasma concentrations needed for complete blockage of the target receptor. For selection of the GIP(1-42) infusion rate (1.5 pmol kg−1 min−1), we aimed at postprandial levels (50–80 pmol/l). Based on the in vitro affinity data [17, 37] and inspired by human studies with the GLP-1 receptor antagonist exendin(9-39) [38, 39, 40], we estimated that an agonist–antagonist relationship of around 500-fold would result in at least 50% inhibition of GIP-induced insulin secretion. It is possible that infusion of GIP(3-30)NH2 at the chosen rate (i.e. 800 pmol kg−1 min−1) would have an inhibitory effect during normal physiological circumstances of more than the calculated value of approximately 80% of the effects of endogenous postprandial GIP(1-42) levels as both the plasma glucose and GIP(1-42) concentrations reached in this study were in the high postprandial range. As GIP(3-30)NH2 is a competitive GIP receptor antagonist without agonistic properties, a sufficiently high antagonist/agonist ratio will block the GIP receptor completely. It is crucial for the interpretation of our results and forthcoming studies that GIP(3-30)NH2 is a selective GIP receptor antagonist without agonistic properties. The secretin receptor family and the endogenous ligands have similarities [41, 42, 43] that might allow interactions with GIP(3-30)NH2. GIP(1-42) may, in high concentrations, activate the GLP-1 receptor, and GLP-1 may also activate the GIP receptor. Indeed, the potent and widely used GLP-1 receptor antagonist exendin(9-39) is able to inhibit the GIP(1-42)-induced GIP receptor activation . In contrast, GIP(3-30)NH2 did not bind to the GLP-1 receptor or the other selected receptors and did not activate the GIP receptor . GIP(3-30)NH2 is therefore a selective GIP receptor antagonist in humans. As a consequence of the interruption of important feedback mechanisms, hormone antagonism may stimulate the secretion of endogenous hormones. This is seen during exendin(9-39) infusions where the secretion of GLP-1 (and peptide YY from the same cells) increases rapidly [44, 45], perhaps because of an inhibition of paracrine somatostatin secretion . Another prominent example is the glucagon secretion following glucagon receptor antagonist administration, which is likely to be due to a feedback stimulation by amino acids . However, during the short duration of these studies, there was no increase, not even a tendency towards an increase, in GIP secretion during antagonist administration. GIP(3-30)NH2 is the first GIP receptor antagonist used in humans, and in a subsequent study we have shown that the antagonist also inhibits triacylglycerol uptake in adipose tissue . This confirmed that GIP(1-42) increases adipose tissue blood flow and triacylglycerol deposition via the GIP receptor and demonstrated that GIP(3-30)NH2 can inhibit these processes. Under the present study conditions, infusion of GIP(3-30)NH2 was not associated with any changes in peripheral plasma lipid concentrations consistent with the lack of acute effects of GIP on these variables, as previously reported . Importantly, the antagonist did not elicit any side effects or discomfort. Our studies suggest that GIP(3-30)NH2 may be useful to antagonise the actions of endogenous GIP, and future studies should therefore be devoted to unravelling the many uncertainties regarding the physiological roles of GIP . Such studies could imply a mixed meal test or administration of glucose, which will stimulate endogenous GIP secretion. Administration of GIP(3-30)NH2 may then delineate the contribution of GIP to postprandial insulin secretion (the incretin effect), how important GIP is for the deposition of triacylglycerols in adipose tissue, and how important GIP may be for the postprandial inhibition of bone resorption. The naturally occurring GIP receptor-specific antagonist GIP(3-30)NH2 is well tolerated and inhibits GIP-potentiated glucose-stimulated insulin secretion by 82% under the chosen experimental conditions. The peptide is therefore a new scientific tool that can facilitate future studies of GIP. The authors sincerely thank the study participants for their dedication. We thank S. M. Schmidt (Center for Diabetes Research, Gentofte Hospital, Denmark) and I. A. Nachar (Center for Diabetes Research, Gentofte Hospital, Denmark) for laboratory assistance during the clinical study. In addition, the authors thank L. B. Albæk (Department for Biomedical Sciences, University of Copenhagen, Denmark) for GLP-1 measurements and J. Bach (Department for Biomedical Sciences, University of Copenhagen, Denmark) for NEFA and glycerol measurements. The clinical studies were conducted at Center for Diabetes Research (Gentofte Hospital, Denmark) and the in vitro studies at Department of Biomedical Sciences (University of Copenhagen, Denmark), which were supported by Gangstedfonden, the European Foundation for the Study of Diabetes, and Aase og Ejnar Danielsens fond. GIP(3-30)NH2 as a therapeutic agent is protected by intellectual property rights owned by University of Copenhagen (PCT/DK2015/050266). AHS, MBC, FKK, MMR, JJH, LSG, and MBNG are co-founders of the company Antag Therapeutics ApS founded after the completion of the present study. TV has received lecture fees from, participated in advisory boards of, consulted for and/or received research grants from Amgen, AstraZeneca, Boehringer Ingelheim, Bristol-Myers Squibb, Eli Lilly, MSD/Merck, Novo Nordisk and Sanofi. FKK has received lecture fees from, participated in advisory boards of, consulted for and/or received research grants from Amgen, AstraZeneca, Boehringer Ingelheim, Eli Lilly, MSD/Merck, Novo Nordisk, Sanofi and Zealand Pharma. Other authors declare that there is no duality of interest associated with their contribution to this manuscript. LSG, MBC, AHS, TV, MMR, JJH, and FKK designed the clinical study, and LSG and ARL performed the clinical study and data acquisition. LSG, AHS, MBNG and MMR designed the in vitro studies, and MBNG performed them. LSG and BH performed the RIA and ELISA measurements. BH was responsible for RIA and ELISA data acquisition and interpretation. FD was responsible for the NEFA and glycerol measurements, analyses and interpretation of data in general. LSG, MMR, MBC, and FKK performed the data analyses, wrote the manuscript and approved the final version. MBC, BH, ARL, AHS, MBNG, FD, TV and JJH edited the manuscript and approved the final version. LSG and FKK are the guarantors of the clinical part of the study, had full access to all of these data and take responsibility for the integrity of the data and accuracy of the data analysis. LSG and MMR are guarantors of the in vitro part of the study, had full access to all of these data and take responsibility for the integrity of the data and accuracy of the data analysis.